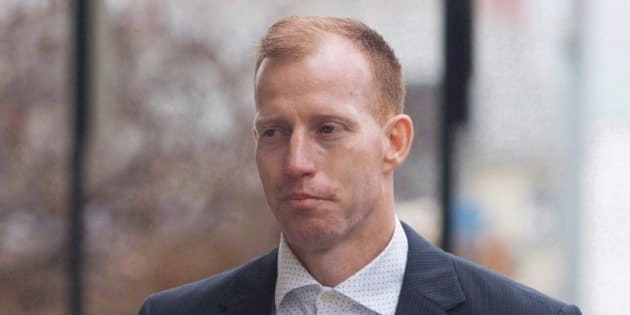 Travis Vader has pleaded not guilty to two counts of first-degree murder. EDMONTON — A judge is allowing a news camera to broadcast his verdict in the murder trial of a man accused of killing two Alberta seniors. Court of Queen's Bench Justice Denny Thomas says it will increase the public's confidence in the judicial system, but he adds it's a one-time ruling. Several media outlets had asked Thomas to allow the camera in court for his verdict on Thursday. They argued there is public interest because of the cost of the extensive police investigation and trial. Travis Vader has pleaded not guilty to two counts of first-degree murder in the 2010 deaths of Lyle and Marie McCann, who vanished on a camping trip. The McCanns, in their late 70s, were last seen fuelling up their motorhome in their home town of St. Albert, just north of Edmonton, before heading to British Columbia. Their burning vehicle was found two days later in a remote area west of the city. The Crown has argued that Vader was a desperate drug user living in a makeshift camp when he came across the McCanns and killed them. The defence contends that, without the bodies or a murder weapon, the Crown's case is based on sketchy circumstantial evidence that doesn't add up. It's a complicated case that took six years to get to trial. The Crown stayed the charges against Vader in 2014, then laid them again nine months later. Vader has claimed malicious prosecution and filed lawsuits against police and prosecutors. "Public access by live feed is particularly suitable in this case due to the significant public interest surrounding the investigation and trial of the accused,'' said the court application submitted by the CBC, the Edmonton Journal, Global News, CTV and The Canadian Press. The Supreme Court of Canada has broadcast most of its cases since 1995 and other provinces have allowed cameras to record some court decisions, says a media affidavit. The Crown was opposed to having a camera in the courtroom for the Vader verdict. The defence and the McCann family said they supported a public broadcast of the decision.